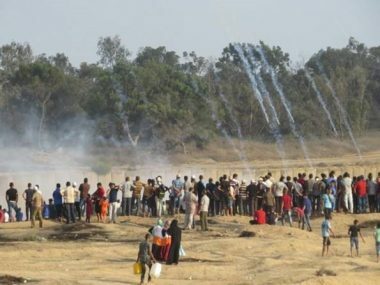 GAZA, PALESTINOW.COM — Zionist Air Force carried out, on Saturday afternoon, dozens of airstrikes targeting sites, reportedly run by armed resistance groups, and the areas around them, in several parts of the besieged Gaza Strip. The Israeli army “sent messages to Hamas through an intermediary this week that it will no longer tolerate incendiary kites and balloons being sent across the border, and will conduct a harsh military response against Hamas targets in the Gaza Strip if it continues”, reported Haaretz. The paper noted recent reports that “the army has a combat plan for Gaza, which includes the entry of large-scale forces at certain stages and the control of large expanses of territory”. 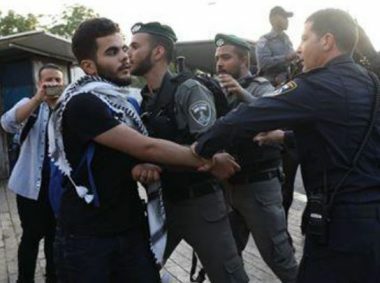 For now, however, the assessment is that the Israeli military “is not interested in embarking on such an operation because it estimates that such a step would be drawn out and the fighting intense”. According to Haaretz, “the prevailing view” among senior army officers is that the challenge posed by the incendiary kites and balloons “does not justify dragging Israelis into days of fighting, certainly not at a time when the army has turned its attention to its northern border”. 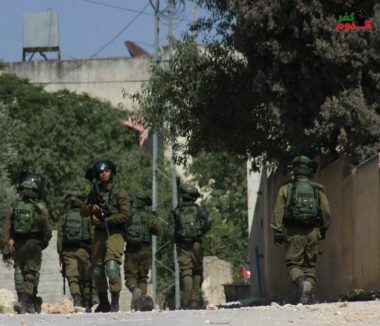 However, the report added, “if the situation continues to escalate, however, military action in Gaza is possible”, with the army said to believe that “such an operation would need to be sufficiently aggressive against Hamas, but at the same time not enough to seriously escalate the situation”. Haaretz referred to a report last week by journalist Ben Caspit that defence Minister Avigdor Lieberman is angling for “harsh and extensive action against Hamas that would restore Israeli deterrence in the region”, in defiance of the views of the heads of both the military and Shin Bet. Another factor, the paper noted, is “pressure on politicians”, and thus “pressure on the military”, if and when “Israeli residents in the Gaza border area lose patience”. 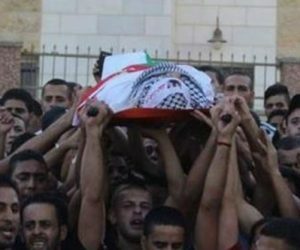 Thousands of Palestinians, including dozens of representatives of national factions and civil society organizations participated, Saturday, in the funeral procession of a Palestinian from the northern West Bank governorate of Nablus, after Israel held his corpse for more than three months. 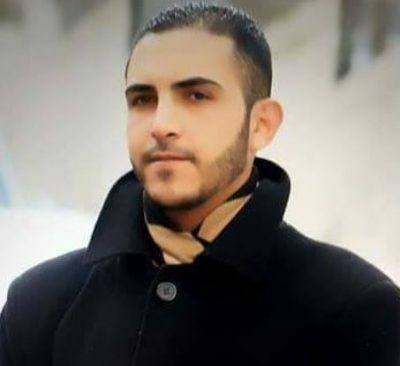 Media sources in Nablus said the army handed the corpse of Mohammad Abdul-Karim Marshoud, 30, to the Palestinian side at Jeet Junction, east of Nablus, before it was moved to Rafidia governmental hospital. Mohammad’s corpse was later transferred to his family, in Balata refugee camp, east of the city, and his funeral ceremony was held at the local mosque. It is worth mentioning that Marshoud died on April 9, 2018, from serious wounds he suffered a day earlier when an Israeli colonial settler shot him near Mishor Adumim illegal colony between Jerusalem and Jericho, reportedly after he attempted to carry out a stabbing attack with a screwdriver. The Israeli Air Force carried out, on Friday at night, many airstrikes reportedly targeting centers run by armed resistance groups, in the central and northern parts of the Gaza Strip. The Israeli army claimed it was retaliating to a grenade which was hurled at soldiers operating near the border fence, Friday, moderately wounding a commander, who was rushed to Soroka Medical Center. 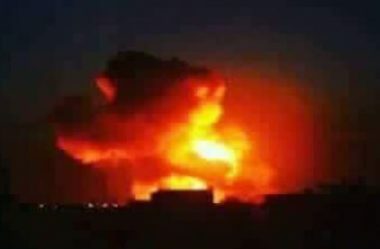 The army said the incident took place in northern Gaza, near the old Karni Crossing, and that the soldiers fired back at the Palestinians, while the Israeli Air Force fired missiles resistance-run centers in the northern and central parts of the coastal region. Following the incident, Palestinian fighters fired several homemade shells into Israeli colonies across the border fence. The army said its Iron Dome system intercepted at least two shells, fired from Gaza, into the nearby Sderot and Eshkol settlements. Earlier Friday, the soldiers killed a Palestinian child, identified as Othman Rami Hallas, 15, and injured 220 residents, including one journalist and two medics, during Great Return March protests in the Gaza Strip. A statement by the ministry of health stated that around 300 protesters were wounded including eight in serious conditions. Israeli occupation snipers stationed along the barbed wire placed in the east of Gaza Strip shot dead on Friday two Palestinian boys during their participation in the activities of the Great March of Return. 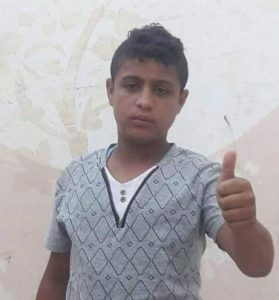 Palestinian ministry of health said that Othman Hellis, 15, was shot dead while demonstrating in the east of the Gaza City. “Hellis was shot with an exploding bullet in the head,” a statement said, noting he was killed immediately and taken dead to the hospital. 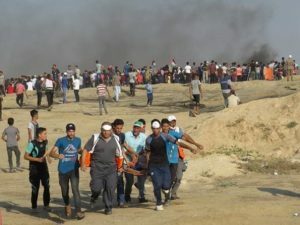 Meanwhile, the other boy, Nasser Shurrab, 17, died of his wounds sustained on Friday when he was protesting in the east of the southern Gaza city of Khan Younis. 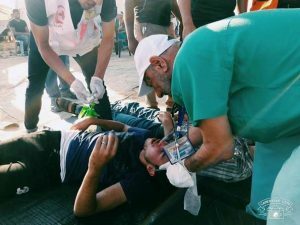 The statement of the ministry of health stated that the Israeli snipers also wounded around 300 other protesters, including eight suffering serious injuries.